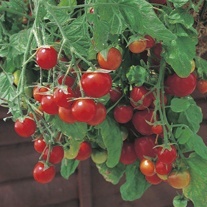 Juicy medium-sized cherry toms for baskets or tubs. Determinate (bushy habit) best outdoors. Excellent source of vitamin C and antioxidants. Determinate. Sow indoors March-April. A warm kitchen windowsill is all you need for starting these seeds. Sow thinly, 0.5cm (¼") deep, in a pot of compost. Water well and place in a warm position. A temperature of 15-20°C (60-68°F) is ideal. Keep moist. Seedlings usually appear in 7-14 days. Transplant to individual pots when 10-15cm (4-6") tall. Grow on in cooler, but not cold conditions. 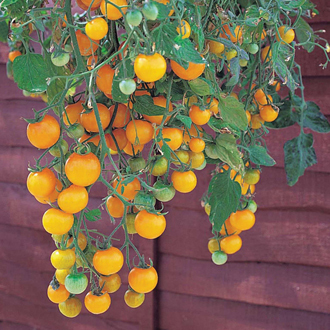 Gradually accustom plants to outside conditions (avoid frosts), before planting out May-June into fertile compost in patio tubs with drainage holes or baskets, when frosts are over. Harvest: August-October. Little space - no problem: Specially selected to grow in containers or small garden spaces, so good crops of tasty, nutritious vegetables can be harvested from your patio, balcony or courtyard. Do not pinch out side shoots. Growing tips can be removed if trusses become too large. Water and feed regularly.